Dream Lake is a commercial fishery located in Chiang Mai Province in Northern Thailand which has been stocked with various monster freshwater fish species. The fishery is a short drive from Chiang Mai airport and boasts an impressive stock of fish with various predatory species and carp residing in its depths.The fishery covers an area of six rai with variable depths going down to twenty metres in the centre of the lake. The lake has several undercut banks and some formidable underwater snags for anglers to contend with. Several comfortable bungalows are sited around the lake offering anglers comfortable overnight Fan accommodation. This venue can be described as challenging water which is capable of producing good sized Giant Siamese Carp with the chance of catching a variety of other catfish and predatory species . 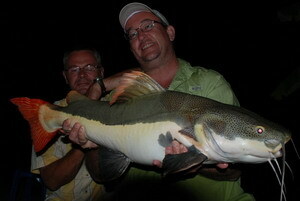 This venue is under European ownership and the German owner Reiner is always onsite for fishing advice and assistance. Whilst fishing at this venue anglers are requested to abide by the fishery rules which are in line with standard rules observed at European fisheries. 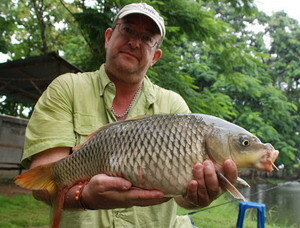 The venue which is situated in Chiang Mai benefits from an impressive stock consisting of Giant Siamese Carp, Mekong Catfish, Chaophraya Catfish, Giant Snakehead,Arapaima, Peacock Bass ,Common Carp and numerous other freshwater species both native and imported. Anglers visiting this venue should expect to work hard to catch fish but will be rewarded with multiple captures of quality fish when applying bait correctly.Productive fishing methods at this venue include fishing for the predators with small live baits in addition to more conventional carp fishing tactics using method feeders loaded with groundbait and popped up hooks for the various carp species. With the considerable distance between Bangkok and Chiang Mai it is advised that anglers wishing to fish at Dream Lake spend a few days at this venue or combine it with aSnakehead fishing trip at Mae Ngat Dam, Sirikit Dam or the River Ping National Park. A wide selection of bait is available onsite for a small additional cost covering all fishing situations. Anglers visiting the Chiang Mai region in the North should consider spending a relaxing day at this venue soaking up the atmosphere and wiling away the afternoon with a cold beer. Great food is available onsite and can be delivered to your swim as well as a host of nearby cultral attractions to keep non angling companions content.